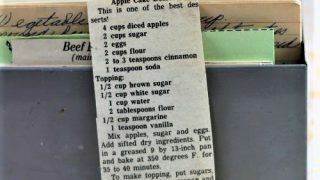 Front of the recipe card for Apple Cake Dessert. 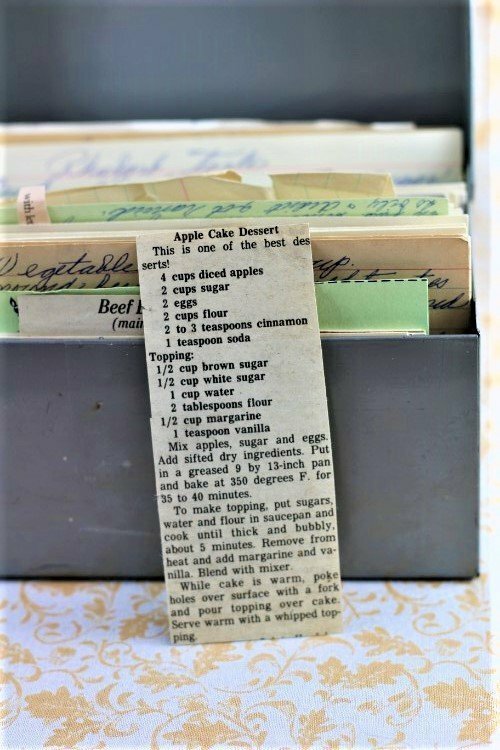 There are lots of fun recipes to read in the box this recipe for Apple Cake Dessert was with. Use the links below to view other recipes similar to this Apple Cake Dessert recipe. If you make this Apple Cake Dessert recipe, please share your photos and comments below! Mix apples, sugar and eggs. Put in a greased 9 by 13-inch pan and bake at 350 degrees F. for 35 to 40 minutes. To make topping, put sugars, water and flour in saucepan and cook until thick and bubbly, about 5 minutes. Remove from heat and add margarine and vanilla. While cake is warm, poke holes over surface with a fork and pour topping over cake. Serve warm with a whipped topping.